One of the Wheeling Freight Terminal crew members has a neat method of creating scrap steel loads for gondolas. Here’s Mike Weiss with some ideas you can use on your layout. 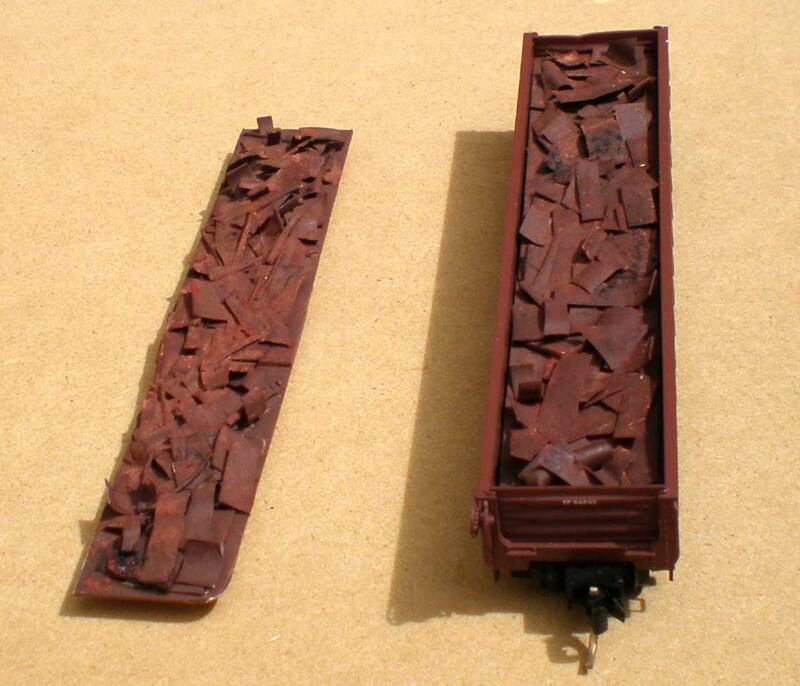 Articles in model railroad magazines about making scrap steel loads for gondolas have often not considered industry standards for scrap composition and size. Additionally they usually don’t provide an easy way to remove a load without a wire loop or hidden magnet. We will address both issues in this blog post. Much information regarding scrap, including specifications, can be found at the website for the Institute of Scrap Recycling Industries. Scrap load composition depends on the receiver of the metal. Scrap destined from a smaller scrap yard to a larger processing yard may contain more mixed materials as the processing yard sorts the scrap and reduces it to an acceptable size. Steel scrap destined for a consumer such as a steel mill or foundry is processed to meet industry requirements. There are size limitations on the scrap so it will fit into melt furnaces. Types of iron or steel in the scrap affect the chemical composition of the finished product so are controlled as much as possible through segregation of scrap materials. Steel scrap does vary with the era modeled. For example automobile shredders were not common before the late 1960s, so shredded scrap was not shipped. Easy to model common scrap grades shipped to steel mills are #1 and #2 heavy melting steel and plate and structural steel. There are grades for railroad ferrous scrap, so you can get rid of loads of old wheels, axles, castings and rails. Again, you should be aware of size considerations such as rail lengths. This will be a description of modeling loads consisting largely of plate and structural scrap. This material can be generated through demolition work or as scrap from industrial manufacturing. Much scrap destined for a mill or foundry must be less than 60-inches on the long dimension and 18- or 24-inches on the short dimension. Getting a material that is thin enough to represent scrap steel sheet or plate is difficult as much real life fabrication is done using material 1/8 or 1/4-inch thick. Some loads have material less than 24-inches square. Although generally too thick, suitable material for modeling scrap steel plate, includes plastic blister packs, containers from your grocery deli section, plastic drink cups and lids, plastic water bottles and wrap around plastic labels from water bottles or plastic jars. The thinnest material was the labels (0.004-inch when painted) followed by the water bottles (0.009-inch when painted). Blister pack material, take-out food cups and water cups vary from 0.012 to 0.016-inch thick. Depending on how the material is cut, it can be flat, curved or have a shape as if it came from a steel fabrication. Use cut up pieces from all these sources for variety. Again although these materials are thicker than scrap sheet or plate reduced to scale, the difference will be hard to notice for most observers. To get variations in contour of the load use thicker material on the bottom of the load as it will mostly be covered by subsequently added material. Great sources for this are plastic cards from annoying mailers for credit cards. These cards vary from 0.018 to 0.030-inch thick. Pieces of wire can be used to represent steel rod or bars and plastic straws for pipe. Specifications call for pipe over 8-inch diameter to be split, so cut straws lengthwise. If you have fine plastic sprues, use a few pieces can offer variety and the appearance of scrapped fabrications. Thick sprue sections can be cut into small pieces, roughly 1/4-inch or less to represent scrapped castings in loads separate from the steel scrap. Cut all material to a five foot maximum length and two foot width, with many smaller and non rectangular pieces. One water bottle and one container will each make multiple loads. One problem with using the bubble pack, cups or bottles is that they are transparent so pieces that fall to the floor, or even those on the work surface, can be hard to find. Also it is difficult to judge the appearance of the load as you assemble it. Paint the items gray or reddish brown with a rattle can before cutting them into the scrap load pieces. First attempts using foam core for the base were not satisfactory do to slight warping of the foam core. Subsequent attempts using scrap styrene were satisfactory. Cut a piece of styrene to fit the gondola interior. Be sure the piece can be inserted and removed without binding, but not fit too loosely. For HO scale, 0.040 to 0.060-inch thick styrene sheet works well. For N scale, 0.020-inch thick styrene is suitable. If one piece will not fit the car, overlap base pieces as they will be covered and the overlap not visible. Cut two longitudinal pieces about 1-1/2-inches shorter than the gondola length for HO or larger scales, or about 1-inch for N scale. The purpose of these pieces is to prevent warping of the base. Center the stiffeners lengthwise on the underside of the base piece and slightly in from the edge. If the base is made from more than one piece, add shims between the top of the stiffeners and the base piece to keep the bottom of the stiffeners level. The width of the stiffeners plus the thickness of the base piece should put the top of the base about 2 scale feet below the top of the gondola sides. If you are not sure, make the stiffeners narrower and add shims under the stiffeners when the scrap has been added and you can determine the desired height of the load in the car. At this point, you may want to mark the bottom of this load as to what models it fits best. Not all gondolas have the same interior dimensions. It is easiest to mark the load for Bowser GS, or Accurail AAR at this point than after the scrap has been glued in place. Paint the base piece black or dark red, otherwise some white may show when the load is viewed at some angles. Glue your pieces of scrap steel to the base, putting thicker and longer pieces on the bottom where they will not be seen in their entirety. Add more material in layers with each succeeding piece randomly overlapping those under it. Skew pieces and put some at slight vertical angle as would occur when the gondola is loaded with a magnetic crane. Three layers should be sufficient to give an impression of a full loaded car. Fully visible pieces should have dimensions no more than 2 x 5 feet, and several should be smaller. Mike also built a couple of scrap loads to fit N scale gondolas. Check the fit of the load in the gondola to be sure the height is correct, i.e. slightly below the sides of the car and to be sure the load fits easily with no big gaps on sides or ends. To remove the load, simply press on one end and the load will tip up so you can grab it. This is why the stiffeners do not cover the full length of the base. 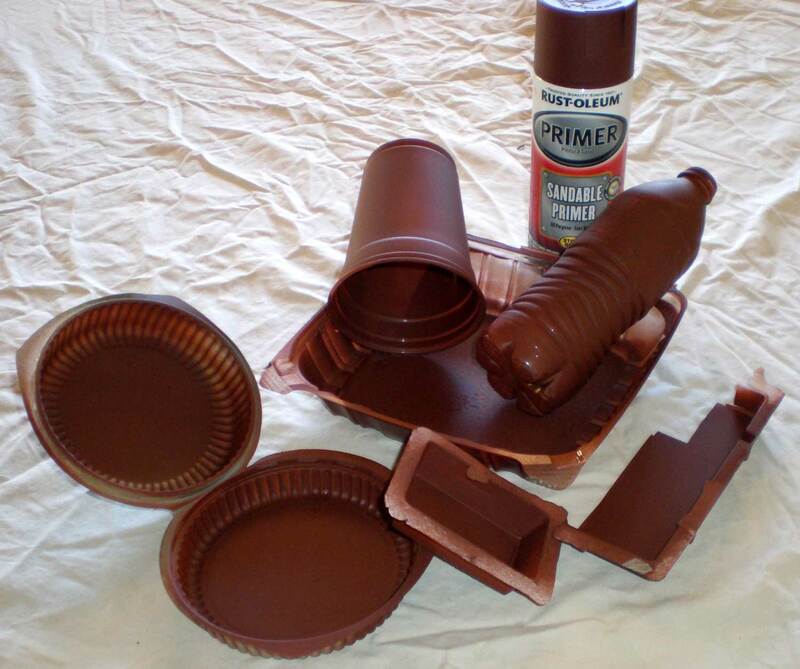 If you did not use pre-painted material, spray the load with a light to medium flat brown paint such as an inexpensive camouflage spray paint. Allow the paint to dry until you detect no odor. Don’t rush this step. A few hours to overnight works well. Use acrylic craft paints and powdered pastels or chalks to apply color variation in the load. Spare use of black, a couple of red shades, an orange shade, and white are effective. Use washes of color similar to weathering a car or structure. Randomly put a small dot or two of color on an individual scrap piece, dip the brush in water or dilute color wash and spread the paint. Apply multiple washes of color on different pieces. The goal is to make individual pieces subtly different from other pieces in a load of mostly uniform color. This is a good time to practice weathering techniques. 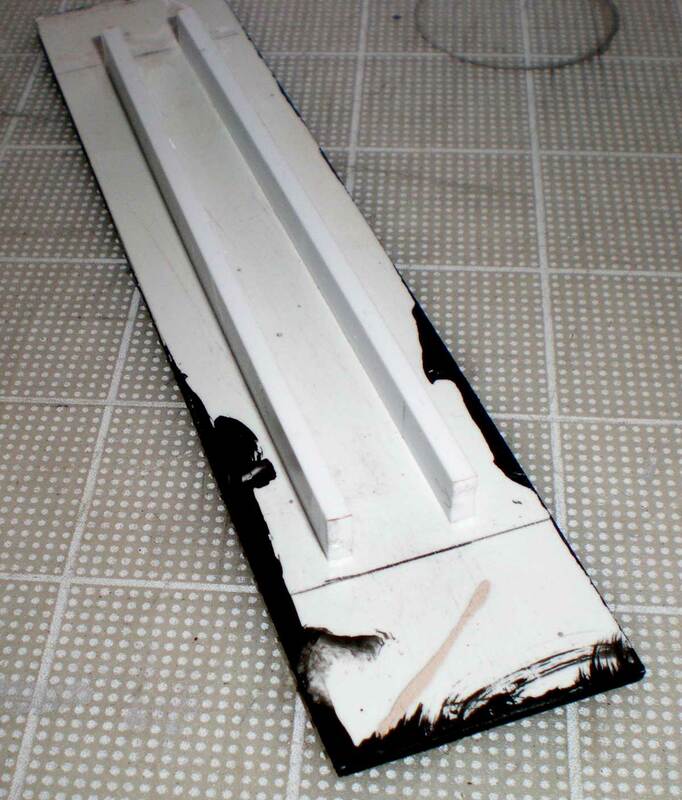 Unless scrap loads are largely post-consumer, they will seldom have painted surfaces. Often the metal has been exposed to outdoor elements and has rusted to varying degrees. If I were to use color, it would be very lightly applied, almost like dry brushing. If I were modeling baled or compressed steel, I would use some color and a lot less rust as bales and compressed scrap are usually lighter gauge material that has had a paint coating. Finally brush on powered pastel chalks in brown and red shades, black and white. Brush some on dry, some with a wet brush to vary the effect. When you are happy with the result, stop. Be sure the load is easily installed and removed from the gondola and you have a new shipment for your railroad. You don’t need to have a scrap processor or steel plant or foundry on your layout. Loaded gondolas offer a variation to empty gondolas and trains of enclosed cars such as boxcars, tank cars and refrigerator cars. Thank you, Mike Weiss, for sharing prototype scrap metals detail and your scrap load modeling techniques. Thanks for dropping by and reading the blog. Feel free to share a comment in the section below. Please follow the instructions so your comment can be posted. All comments are reviewed and approved before they appear. To subscribe to this blog, enter your info for a comment and check the last box to notify of new posts by email. I’m off the the hardware store to buy some spray paint cans to try this. Any special type of glue that you have found most suitable for this purpose? That was a great post! Those model scrap loads look superb. Thanks for taking the time to put this together for us. Great idea! I have lots of Gons that will need to have scrap loads. If one places a washer in the bottom of the load they can be removed with a magnet and the products can be shipped out from the mill in the same gon by changing the load! Loads in Loads out! I would also suggest a label on the bottom of th load to specify what car it will fit. Too bad I don’t have time for this before the open house tomorrow. Thanks for a terrific idea. Some excellent ideas, here. I have some gondolas looking for loads and you gave me the answer. Thanks for sharing. Neat idea. Great looking scrap loads. Now to build a few. Mike thanks for sharing. Great article, and easy to do. Very informative. Thanks for taking the time to enrich our collective modeling experience. Great article and links to follow up. I have a bunch of Gons that need to treatment over the next few months and I’ll be trying out this technique. Wanted to let you know that I posted a link to this article on my Andrew’s Trains blog: http://huntervalleylines.com also. Deserves to be shared with my readers too. I collect scraps from my workbench. The assorted bits and pieces make a great load especially when the pieces are painted various colors. Sorry the pic isn’t high enough angle to show the load well. Cool ideas. I need some for a CNJ gon I just finished.